"Parris Island" redirects here. For other uses, see Parris Island (disambiguation). "Paris Island" redirects here. It is not to be confused with Island of Paris. Marine Corps Recruit Depot Parris Island (often abbreviated as MCRD PI) is an 8,095-acre (32.76 km2) military installation located within Port Royal, South Carolina, approximately 5 miles (8.0 km) south of Beaufort, the community that is typically associated with the installation. MCRD Parris Island is used for the training of enlisted Marines. Male recruits living east of the Mississippi River and female recruits from all over the United States report here to receive their initial training. 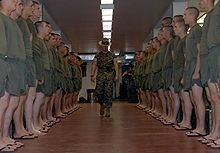 Male recruits living west of the Mississippi River receive their training at Marine Corps Recruit Depot San Diego, California, but may train at Marine Corps Recruit Depot Parris Island by special request. A French Huguenot expedition, led by Jean Ribault in 1562, was the first European group to attempt to colonize Parris Island. Earlier Spanish expeditions had sighted the area, and named it "Punta de Santa Elena", which now remains one of the oldest continuously used European place names in the United States. The French expedition built an outpost named Charlesfort, and Ribault left a small garrison as he returned to France for colonists and supplies. After a long absence, due to Ribault's delay from wars in Europe, Charlesfort was abandoned after the garrison mutinied, built a ship on the island, and sailed back to France in April 1563. In 1566 the Spanish, led by Pedro Menéndez de Avilés founded a settlement named Santa Elena which became the capital of La Florida for the next decade. Spain finally abandoned Santa Elena in 1587. England took control of the region by the 17th century, and Parris Island became home to British plantations after being purchased by Colonel Alexander Parris, treasurer of the South Carolina colony, in 1715. From the 1720s to the Civil War, the island was divided into a number of plantations, initially growing indigo, then later cotton. During and after the Civil War, the island became home to freed slaves, and was a site of freedmen schools taught by abolitionists such as Frances Gage and Clara Barton. Union forces captured Port Royal Sound in 1861, and Parris Island became a coaling station for the Navy. This function was taken up again after the war, thanks in large part to the former slave turned Congressman Robert Smalls, who fought for the creation of a new federal military installation on the island. Marines were first assigned to Parris Island on June 26, 1891, in the form of a small security detachment headed by First Sergeant Richard Donovan, two corporals and 10 privates. This unit was attached to the Naval Station, Port Royal, the forerunner of Parris Island. Donovan's unit was highly commended for preserving life and property during hurricanes and storm surges that swept over the island in 1891 and 1893. Military buildings and homes constructed between 1891 and World War I form the nucleus of the Parris Island Historic District. At the district center are the commanding general's home, a 19th-century wooden dry dock and a start of the 20th century gazebo—all of which are on the National Register of Historic Places. Prior to 1929, a ferry provided all transportation to and from the island from Port Royal docks to the Recruit Depot docks. In that year the causeway and a bridge over Archer's Creek were completed, thus ending the water transportation era. The causeway was dedicated as the General E. A. Pollock Memorial Causeway in April 1984. During the fateful December 1941, 5,272 recruits arrived there with 9,206 arriving the following month, making it necessary to add the 5th, 6th, 7th and 8th Recruit Training Battalions. As the war influx continued, five battalions were sent to New River, North Carolina, to train, and the Depot expanded to 13 battalions. From 1941 through 1945, the Marines trained 204,509 recruits here and at the time of the Japanese surrender, the Depot contained more than 20,000 recruits. On February 15, 1949, the Marines activated a separate "command" for the sole purpose of training female recruits. Later, this command was designated the 4th Recruit Training Battalion and it now serves as the only battalion in the Corps for training female recruits, and is the only all-female unit in the Department of Defense. The Korean War began in 1950 when 2,350 recruits were in training. From then until the 1st Marine Division withdrew from Korea, Parris Island drill instructors trained more than 138,000 recruits. During March 1952, the training load peaked at 24,424 recruits. The recruit tide again flooded during the years of the Vietnam War, reaching a peak training load of 10,979 during March 1966. On the night of April 8, 1956, the Ribbon Creek incident resulted in the drowning of six recruits, and led to widespread changes in recruit training policies. Supervision of drill instructors was expanded, such as the introduction of the Series Commander. 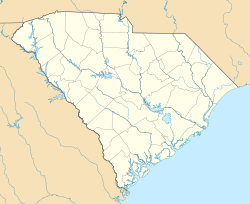 On October 11, 2002, the Town of Port Royal annexed the entire island, although most visitors still associate the installation with Beaufort, a larger community five miles to the north. On June 17, 2011, Brigadier General Lori Reynolds became the first female commander of the base. At the next change of command on June 20, 2014, Brigadier General Terry Williams became the first African-American commander of the base. A senior drill instructor inspects his platoon shortly before lights out. The Marines train about 17,000 recruits at Parris Island each year. 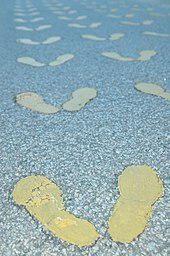 Recruit training for those enlisted in the United States Marine Corps includes a thirteen-week process during which the recruit becomes cut off from the civilian world and must adapt to a Marine Corps lifestyle. During training, the drill instructors train recruits in a wide variety of subjects including weapons training, Marine Corps Martial Arts Program, personal hygiene and cleanliness, close order drill, and Marine Corps history. The training emphasizes physical fitness and combat effectiveness. Recruits must attain a minimum standard of fitness to graduate. This standard includes a Physical Fitness Test and a Combat Fitness Test. Recruits must also meet minimum combat-oriented swimming qualifications, qualify in rifle marksmanship with the M16A4 service rifle, pass minimum curriculum standards and complete a 54-hour simulated combat exercise known as "The Crucible". Parris Island is depicted in the film The D.I. (1957), directed by and starring Jack Webb. Parris Island is depicted most famously in Stanley Kubrick's movie Full Metal Jacket (1987), featuring R. Lee Ermey as a memorable drill instructor ("DI"). Ermey was formerly a Marine DI at San Diego and served as technical consultant on building the film set. The JAG episode titled "Boot" was set at MCRD. Parris Island is the setting of several flashbacks in the TV series Revolution. Billy Joel's song “Goodnight Saigon” mentions the U.S. Marine Corps training base multiple times (“We met as soulmates on Parris Island”). ^ "History of Parris Island". Marine Corps Recruit Depot. United States Marine Corps. Retrieved 17 January 2017. ^ "Parris Island Drydock and Commanding General's House, Beaufort County (Mexico & Tripoli Sts., Parris Island)". National Register Properties in South Carolina. South Carolina Department of Archives and History. Retrieved 25 February 2014. ^ Population Estimates Boundary Changes Archived 2006-02-06 at the Wayback Machine, United States Census Bureau, 2007-07-01. Accessed 2010-08-19. ^ Rose, Lloyd (June 28, 1987). "Stanley Kubrick, at a Distance". The Washington Post. p. F01. Retrieved April 24, 2008. ^ "Boot". IMDB. IMDB. Retrieved November 22, 2016. ^ Rome, Emily. "Revolution recap: The Birth of a Militia". Entertainment Weekly. Entertainment Weekly. Retrieved November 22, 2016. Da Cruz, Daniel (1987). Boot. St. Martin's Paperbacks. ISBN 0-312-90060-0. Krulak, Victor H. (1984). First To Fight: An Inside View of the U.S. Marine Corps. Annapolis, Maryland: Naval Institute Press. ISBN 0-87021-785-2. Ricks, Thomas E. (1998). Making the Corps. Scribner. ISBN 0-684-84817-1. Woulfe, James (1999). Into the Crucible. Presidio Press. ISBN 0-89141-707-9. Champie, Elmore A. (1958). A Brief History of the Marine Corps Base and Recruit Depot, Parris Island, South Carolina, 1891-1956 (PDF). Washington, D.C.: Historical Branch, United States Marine Corps. Wikimedia Commons has media related to Marine Corps Recruit Depot Parris Island.